When the all-time fastest car around the Nürburgring is a hybrid, there’s no excuse to still think “hybrid” means “slow.” But there’s a reason why even major manufacturers struggle to put electric-assisted cars on the market. 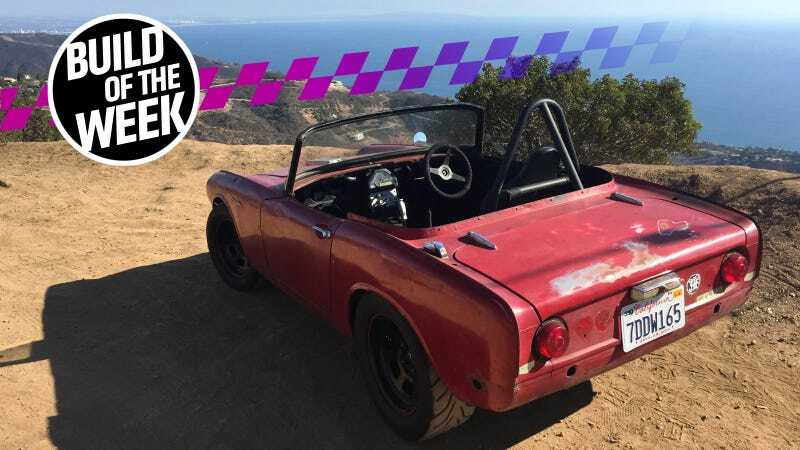 Home-tinkerer Matt Brown (with a NASCAR team and Tesla on his resume) figured out a way to make his own hybrid system for extra speed, yet his CBR1000RR-swapped 1964 Honda S600 proved that adding hybrid power still isn’t exactly simple. Brown purchased his Honda S600 with the goal of swapping in a motorcycle engine. “I had spent my college building motorcycle engine powered Formula SAE cars and kind of wanted one with a license plate,” he told Jalopnik via email. The car as Matt got it. Strangely, it also came with an RX-7 differential. This Honda S600 convertible was perfect—it weighs just 1,576 lbs in stock form according to Honda’s sales lit at the time, and Brown appreciated the fact that it was Honda’s first mass-market production car. Better yet, he found one for sale on a forum without an engine or seats for just $2,000. Fabricating a new intake for the engine. Now that he had the perfect car, Brown also bought a 2007 Honda CBR1000RR powertrain off of eBay for $1,000. 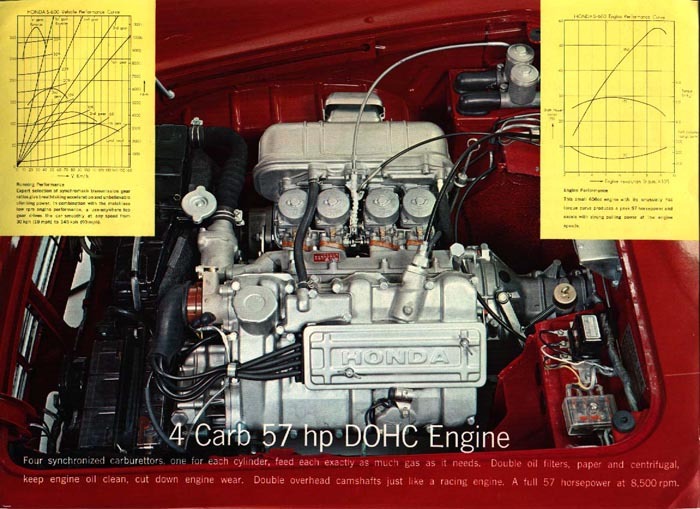 That 998-cc engine kept it in the Honda family and was good for 147 horsepower when new, which was already a big bump over the S600's stock horsepower rating of a mighty 57 achieved at a low, low 8,500 rpm. Since the S600 wasn’t designed to work with a drivetrain multiple decades its junior, Brown welded together custom mounts for the CBR1000RR’s engine to make it work. The air intake for the engine wouldn’t fit under the hood, either, so Brown fabricated a new one that also didn’t fit, but looked close enough. Brown cut a hole in the Honda’s hood to feature his engine’s new, slimmer intake. Brown found a cheap, larger radiator to go with it that would almost fit, so he also cut that down to size and capped it off so it would tuck under the hood. By the time he was done, Brown claimed his CBR1000RR engine cranked out around 160 hp. At the same time, he also bought a Mazda Miata with a blown motor to scavenge for parts. As with the engine, Brown made suspension and brake components from the Miata fit onto the S600 by fabricating up the parts that this more modern technology would need to work. He originally wanted to use the Miata rear subframe, but the S600 was too narrow. Obviously a Miata is a real land yacht, absolutely a huge and colossal car. OK, not really, the S600 is just tiny. In any case, Brown was forced to design and fabricate a rear subframe of his own. If you are beginning to gather that Matt is a very talented automotive individual, you will not be surprised to find “NASCAR engine and chassis development engineer” on his LinkedIn page. Freshly fabricated bellcranks which allowed the shocks and springs to sit sideways in the rear of the car. A rear suspension close-up shows how the bellcranks are used. Brown used Miata half-shafts, outboard suspension components and brakes in the build, but the car is so small and so light he used shocks and springs from a Yamaha R1 motorcycle in the rear, and a Yamaha R6 up front. He also made metal bellcranks that allowed those shocks and springs to fit sideways in the back of the S600, translating vertical motion of the wheel into sideways motion on the coilovers themselves..
Brown installed a custom gas tank just behind the seats to make room for this more complicated suspension system as well as a massive nitrous oxide bottle, too. To continue with that theme, Brown added the differential from a BMW E36, which was welded at first, but eventually replaced with a custom-cut limited-slip differential. An adapter hooked up the CBR1000RR motorcycle transmission to the two-piece BMW driveshaft that sent power to that BMW diff. Inside the car, new seats and harnesses, a switch panel and the stock motorcycle gauge complete the look. The custom diff wasn’t the only upgrade the S600 received after the initial project was “done” three years ago. He also added a hand-operated clutch on the shifter (which feels weirdly fitting for a motorcycle engine swap) and put a bikini top on it. The steering wheel inside the car also came from a boat. Again, the badge says Honda; the philosophy is rat rod all the way. The biggest upgrade, though, was adding a homemade hybrid system to the car. It’s an interesting idea. A bike engine makes power waaaaaaay up in the rev range and offers little in the way of torque. An electric motor, by contrast, offers peak torque from zero rpm. Mating the two, at least conceptually, makes a perfect car yet more perfect. Before this, Brown’s S600 rat rod had already been cool enough to land on an episode of Jay Leno’s Garage, where Leno described the build as one that came from “more brains than money.” It was loud, rowdy and a total riot already, so how do you make it better? Hybrid system, duh. Matt didn’t see a need to mention this, but yes, he does have a little company called “Tesla” on his resume, working as Senior Design Engineer from 2009 into 2014, then again for a while in 2018, with a brief stint in between at another obscure company called Apple. Brown mocked up how everything should fit in CAD before swapping in a hybrid system up front. Note how the chain ties in the internal combustion engine to the electric motor. Brown connected the CBR1000RR engine and the Motenergy ME1304 electric motor in parallel with a chain. He replaced the first part of the car’s two-part driveshaft with a keyed shaft that connects to the electric motor, and the internal combustion engine now drives a chain that’s connected to the electric motor/driveshaft connection. It’s kind of a return to form for this car, given that the S600 was originally chain-drive. A close-up of how the electric motor fits into the car, including the exhaust routing for the motorcycle engine. Brown added a lot of thermal barrier between the exhaust and the electric motor, but it still gets very hot down there. The blue shaft comes from the motorcycle engine, which turns a sprocket that drives a chain which transmits power down to a sprocket that sits between the electric motor and the u-joint for the driveshaft. Brown made sure that the whole chain system is adjustable because he couldn’t get accurate measurements for the location of the electric motor’s output shaft relative to the frame of the car. The internal combustion engine is still mounted directly to the car’s frame, but the new electric motor tucks up in the small space behind it. First, he cut two aluminum plates using waterjet machines to hold the two powertrain components in place. Those two plates sandwich together and hold the electric motor as well as an aluminum piece with a large bearing pressed into it, pointed at by a large yellow arrow in the photo below. Matt used a long vertical bolt that runs along the outer edge of the plates to tension the chain, but that isn’t the only part that can realign these components if needed. The adjustable assembly that attaches the hybrid system to the vehicle frame. That big bearing at the top carries the output shaft from the CBR1000RR engine. The electric motor had to sort of “float” beside these two plates in order for the chain tension to remain adjustable. The four bolts highlighted in yellow in the photo above loosen to allow Brown to adjust the relative location of all the internal combustion engine’s output shaft, too. Testing how the new assembly looks with the motor and chain installed. Brown figured that his guess for the measurements of where the internal combustion engine’s output shaft and electric motor were in relation to each other was somewhere within six millimeters, so that’s how much adjustability up, down, left or right that he has when he loosens the four bolts in his crazy custom sandwich-mount system. The bolts that hold the electric motor in place are all slotted within the plates to allow Brown some additional adjustability on that end. When all the bolts through the two plates are tight, it holds the two aluminum plates together as if it were all one solid structure. And oh, Brown knows exactly what you’re thinking right now. A look through the transmission tunnel to the tight fit for the new hybrid system. The rest of the chain drive has seen some trial and error, as Brown already had to upgrade from smaller, louder 15-tooth sprockets after the power from the whole system going through one short chain tore up the sprockets and stretched out the chain. The really cool thing about Brown’s system is that you can use both powertrains at once, or pick just on use as they’re both always spinning when the car’s going. Putting the motorcycle engine in neutral keeps the transmission countershaft spinning, but allows him to escape his neighborhood far more quietly than he ever could before. The Sevcon controller went behind the dashboard. The blue line visible on the left routes coolant to a cool plate that is mounted to the controller and keeps it operating at the right temperature. Even when the electric motor is not in use, Brown wired the electric motor controller to be always on whenever the car is on. This allows the controller to keep managing the current that goes through when the coils and magnets spin past each other. The controller itself is a Sevcon Gen4 Size 6 AC motor controller rated to handle about 700 amps. He installed just two throttle position sensors on the accelerator—one for the CBR1000RR engine, and one for the electric motor. They’re independently adjustable, but Brown said that he’s kept it simple for now. When the throttle is halfway down, the motorcycle engine throttle opens 50 percent, and the controller gives him 50 percent of the electric motor’s power. On a full charge with a cool motor, the hybrid system puts out about 400 amps, which translates to “about 50 horsepower when the motor is in its happy place,” as Matt put it. Adding the hybrid system also gave it the ability to reverse itself, which the motorcycle engine alone never had. He had to get out and push the car backwards before he went hybrid. Fitting the battery into the trunk. Providing power for the whole system is a quarter of the battery system from a first-generation Chevrolet Volt. A full first-gen Volt battery pack was 16 kWh, and Matt explained that his quarter of one is 4 kWh and 84 volts. There also wasn’t a ton of space to work with around the internal combustion powertrain that was already inside the tiny Honda, but this fit neatly in the trunk. He even reused the stock fuel filler location as a charging port for the battery pack as the gas tank has its own separate filler now. Charging the battery through the old fuel filler cap. He hasn’t figured out a battery management system that would work for the car and his budget quite yet. The one that usually comes with Volt batteries is fairly locked down from most home-tinkerers, and Brown says it’s hard to adapt for other purposes. Instead, he has been checking the cells himself to ensure that they all stay relatively close to each other. Battery management systems control how the batteries handle energy, and can prevent dangerous situations like over-charging or over-discharging each cell. As it is now, the hybrid system is extra-sensitive to voltage, with Matt telling me it’s pumping out twice the power at full battery than when the battery has just 25 percent charge left. This, of course, brings us to the fact that Brown isn’t sure he’s happy with how his homemade hybrid system has actually turned out. We like to think of electrified builds as torquey wonder-cars, but they’re still kind of expensive and hard to get right. There haven’t been a ton of electrical components available on the cheap at the junkyard—Brown’s preferred source for parts—aside from the Volt batteries. He got a good deal on the Sevcon controller, but it’s far from user-friendly and Brown claims that they don’t have a ton of interest in helping anyone who isn’t working for a major automotive company. Having all-electric drive helps Brown navigate areas like this one, which issue citations if your exhaust is too loud. 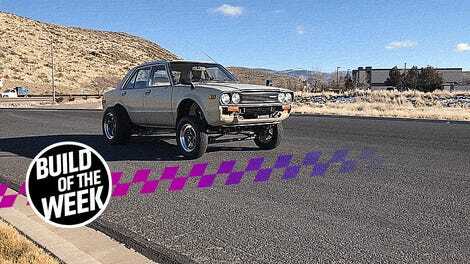 All these extra hybrid components added 150 pounds of weight to a car that weighed just 1,350 pounds as it appeared on Jay Leno’s Garage, which is quite noticeable. Worse yet, because the electric motor is directly driving the driveshaft and not situated before the transmission in the car, it’s just a bit sluggish in electric-only mode under 15 mph. It can only go a few miles on electric power alone, too, as the Motenergy unit’s liquid cooling jackets are so far away from the motor’s rotor and stator (which is the stationary part of the engine that transfers energy to the rotor and makes it spin) that the rotor hits its max temperature just over 200° F—far sooner than it should. It doesn’t help that the hot exhaust is routed right next to the motor, either. It’s so bad that he’s considered drilling a big hole in the side of the motor’s jacket and ducting a fan into said hole to cool it that way. Even with all his doubts over the hybrid system, this car is still a blast. Brown says that putting the pedal to the floor at around 50 mph “feels amazing,” as the CBR1000RR engine puts out around 160 hp, and the electric motor puts out around 50 extra hp. If the nitrous is hooked up, that can add another 50 hp. It’s not long before he hits the car’s top speed of around 125 mph. That may not sound like a lot, but when the whole thing is a 1,500-pound micro-roadster, it gets pretty intense. “It takes off with a power-to-weight ratio of [a] supercar,” Brown said. This doesn’t mean he’s done with homebrew electrification, though. He’d love to try making another attempt in the future, maybe with the internal combustion engine and electric motors powering separate axles, or perhaps go full electric. By then, he’ll probably have better tools to work with, too. “Five or 10 years from now, the electric hot rod scene is going to be bananas,” Brown said. EV technology keeps improving, more and more electric and hybrid cars are showing up in junkyards, and the knowledge base of how to modify the different components gets bigger and more accessible by the day. “In any case, I’m looking forward to the day when I can buy a Tesla drive unit off eBay for $1,000, throw some Power Commander type thing on it, and stuff two of them in a Dodge Viper, just to feel the electric power and the unspeakable blasphemy,” Brown said. I can’t wait to see more builds like that happen, either. You can keep up with Brown’s current and future builds at his personal website here, or on his Instagram here. How the CBR1000RR engine was originally installed. Brown ran the exhaust back to the rear and relocated the muffler in the back where it would normally go, but the electric motor now sits roughly where the exhaust sits in this photo. This CAD mockup of how the two powertrain components will fit together shows the long bolt that Brown uses to tension the chain to the left. Author’s Note: Build of the Week is moving off of a regular schedule, now moving to post individual stories as they come in. Same wild builds, just not on every Friday. Of course I still want to hear about the unhinged things you’re doing with cars anyway. What unique project cars have you been wrenching on lately? Are there any great build threads or fascinating vehicular feats we should know about? Drop me a line at stef dot schrader at jalopnik dot com and tell me about it.